Latest Update "August 4, 2014"
The version is Quite Powerful, IF T1 and T2 are made Correctly. "I DO NOT RECOMMEND ANYONE BUILD THIS DEVICE". "How Simple a Deadly Device can be Constructed". are DEFINATELY Not Understanding enough to Even Attempt Making it. I WILL NOT Offer any Further Construction Details. TO BUILD OR USE THIS DEVICE. BUT IF YOU DO SO, IT IS TOTALLY AT YOUR OWN RISK. "T1"   Was Home Built using a "Magnetics" Ferrite Core # "42620" and a Bobbin # "PCB2620-12". T1 can also be built using a Magnetics Pot Core, OP42616-UG and the PC-B2616-11 Bobbin. I Usually have Stock of Both of these. The Primary Consists of a Dual 18 Turn Bifular wound coil using #26 AWG Wire. It requires 2 layers, with "Nomex" Insulation between them, As well as a layer of Nomex over the Primary. is a dead space on either side. This Prevents possible arcing. Additionally a .003 Inch thick "Nomax Paper Insulation" is Placed between each layers. Before Assembly, the Ferrite core is Gapped to 5/1000 of an inch. "Nomex:"   Is one of many Special Insulator types of paper used in the Transformer Winding Industry. Alternately you can use other Insulators such as "Fish Paper", Although they are Not as Good. 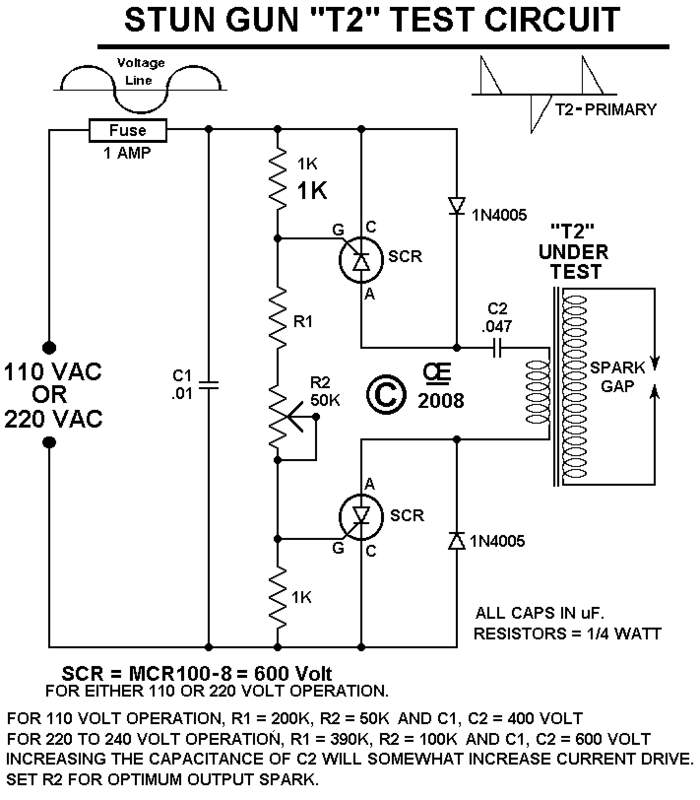 With this Transformer Connected In the Circuit as Shown, Current draw is about 250 Ma at 12 volts With NO LOAD. With the Diodes, Caps, SCR and T2 connected in a Compete Circuit,   "The Current draw can Exceed 2 Amps". EVEN MORE POWER:   A Bigger T1 Can be made Using a 42625 Core and a PCB2625 Bobbin. The Primary Consists of 14 Turns Bifular Wound on Two Layers. 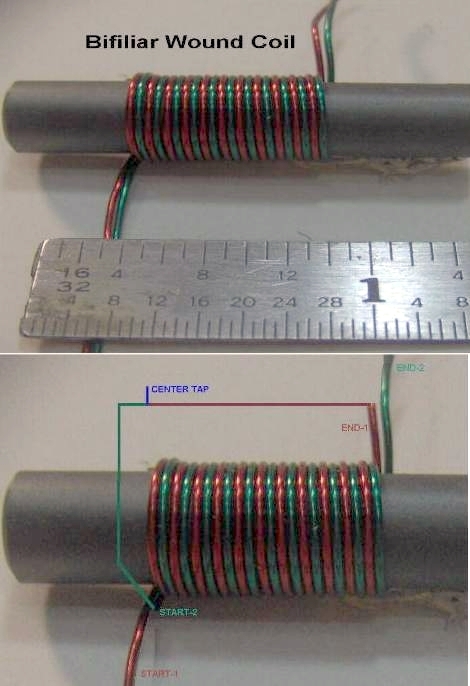 Change the Secondary Wire to a 38 AWG, Double Insulated Wire and use about 45 turns per layer. Fill the Bobbin with as Many layers as Possible, leaving a bit of Clearance between the last layer and the ferrite core. The Gap Remains the Same at 5/1000 of an inch. This Results in a Faster Charging Time and a Higher Supply Voltage. "T2"   Was Wound on a "Fair_Rite" Rod, # "4077375211". It Measures .375 OD by 2 inchs long. "ANOTHER T2"   Was Wound on a "Fair_Rite" Rod, # "4077312911". It Measures .315 OD by 1 1/2 inchs long. Both these are Material 77 and it worked EQUALLY WELL. THINK AGAIN, "YOU ARE BADLY MISTAKEN". I Stock Both these Rods above. And a few more of the second one. First Apply a layer of .003 Nomex Paper Insuation. Now wind a Primary of 25 Turns, 22 AWG wire in a single Layer. It is than covered with a .005 or .008 Nomex Paper insulation. The .008 Nomex is a bit better to keep this Layer more even to wind over. and than LAYER Wound in declining layers at about 10 turns per layer. A layer of .003 or .005 Nomex is placed between Each Layer. 10) Final Layer about 125 Turns with the Output taken off Directly in the Middle, Lenghtwise. And a Final Couple of layers of Nomex are placed over top and Taped in place. Total Turns, About 3,675 turns. But the Exact number of turns is Not All that Critical. The Absolute Ideal is to "Pi" Wind the Secondary, But this Results in a Different number of turns and only a few layers. and than placed in a "VACUUM CHAMBER" and Subjected to a high Vacuum of at least 25 inches of Hg. for a one or two Minutes, than Release The Vacuum. I usually Repeat this Vacuum Process Two or 3 Times. The Reason for this is to Remove all Air Bubbles and have the Epoxy Totally Penitrate between the Windings. The Epoxy Surrounding the transformer should be at least 1/4 inch thick over the Outer layer and 3/8 inch over the Ends. They Actually Require about 24 Hours for a "FULL HARDNESS". 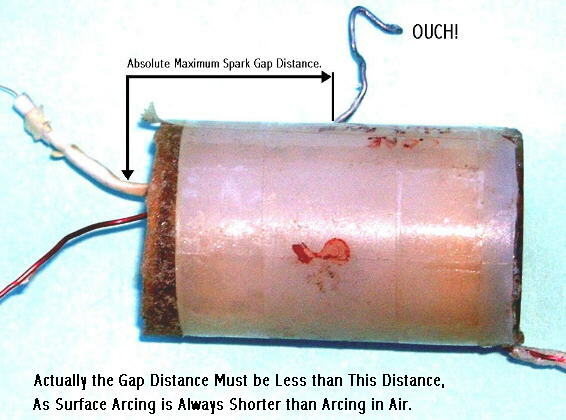 The Correct Spark Gap Distance is Essential in the Completed Unit. The Maximum Distance is a Function of How Well You Made T2. NOTE: Some Info May have been Omitted in the Above! for any "Errors or Omissions". A Real Misconception about Stun-Guns, Is the Voltages. It Sound Good in the Advertisements, But it is Current that does the damage. pentrating through the clothing and Surface Skin is totally sufficant to do the job of Penitration. "Much Higher Current" and REALLY MORE DANGEROUS. than any other electrical supply. And DIFINATELY NEVER the 750,000 volts that these manufacturers make claims of. But in the Process it will short out across the surface of T2. Especially when there is a Relatively limited amount of Current. to help Protect against "Lightning Strikes". You can Roughly Determine the "Actual Output" of a Commerical Built Stun Gun. NOTE: The Actual Schematic Varies Somewhat from this Design! Like I Said, I didn't Intend this as an Actual Construction Article. You should be able to Complete it and make it operational. T2 Verses the Spark Gap. There is A Direct Relationship here and it is Important. The PCB Will Not be Shown.